The reprint of the book The Battle For Merger was launched by the Deputy Prime Minister Teo Chee Hean on the morning of 9 October 2014 at the National Library. The book contains a series of radio talks about the Communist threat in Singapore by then Prime Minister Lee Kuan Yew in 1961. I was invited to an exclusive guided tour of The Battle For Merger exhibition at 12.15 pm the same day. The exhibits consisted of 12 panels and each had a story to tell accompanied by pictures. The exhibits evoked memories of tumultuous days and the radio broadcasts by Mr Lee. His radio talks were captivating and I listened to most of them. During that period there was the domino theory of communism spreading from China to Singapore. China became a communist country in 1949, North Vietnam in 1954 and war continued in South Vietnam with the Vietcong. In Malaya the communist waged violent armed insurgency in 1948 with the British and continued after Malaysia’s independence in 1957. I am English educated but lived in a Chinese educated environment. Most of the people I knew then was leftist and some was active grassroots. The fear that Singapore might become a communist state was so real and listening to Mr Lee’s radio broadcasts made it more frightening. I have one original copy of the book The Battle For Merger printed in 1962 and I treasured it to this day. It reminded me of Singapore’s critical period. At that time I dread to think that Singapore would become a communist state. The Battle For Merger is now history. I was wondering how the younger generation felt after viewing the exhibition. On Saturday 11 October I went to the exhibition to interview some of them. 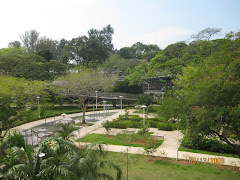 The students viewed it as Singapore’s history. The adults said they heard about it from their parents when they were young. The response from them reminded me of my family’s history. My great grandfather came to Singapore from China without a penny in his pocket. He worked hard to make a fortune for himself and died leaving a legacy in Joo Chiat. My grandmother told me the story when I was young. Like the people I met at the exhibition, I did not feel the hardship and struggle my great grandfather went through during his early years in Singapore. Singapore’s history is taught in our secondary school but their history book do not have the story Battle For Merger. If we want this critical part of our history be known to our students, copies of Battle For Merger should be made available in the school library and teachers should encourage the students to read the book. Merger with Malaysia helps Singapore from becoming a communist state. Getting out of Malaysia is a blessing or Singapore would not be what it is today.